Elle’s Bar introduces its “Bottomless Pancakes” Brunch Menu flowing every Saturday from April 27th throughout the summer. The Iveagh Garden Hotel on Dublin’s Harcourt Street is celebrating one year since it first opened its doors. The timing of the “green” hotel, which utilises sustainable energy sources, couldn’t have been better as businesses are beginning to consider their carbon footprint and what they can do to evolve with the demands of the climate and eco-conscious consumers. More and more consumers are adapting a “flexitarian” diet with many taking up a part-time vegan diet, and Elle’s Bar at the Iveagh Garden Hotel wants to cater to these mindful diners with its new vegan menu. As well as this, the hotel’s Head Chef, Darren O’Brien has devised a delicious new summer menu as the warmer weather approaches. With the more conscientious drinker in mind, Elle’s mixologists have also created a “Conscious Beverage” menu which features several low-calorie, but still extremely tempting concoctions that will suit those watching their weight. Each drink on the list contains 130 calories or less, allowing those trying to slim down to drink without the guilt of consuming empty calories. With summer fast approaching, Elle’s Bar has created a blooming “Botanical Garden” on its outdoor terrace allowing for some alfresco imbibing. Elle’s will launch its new summer season “Botanical Brunch” every Saturday from April 27th – the perfect way to start off the weekend! Head Chef Darren O’Brien says; “All the ingredients on both our vegan menu and the summer menu have been sourced using the freshest, local ingredients. Sustainability is at the heart of the hotel and I wanted that to be a part of the food ethos in the kitchen also.” Vegan favourites such as Cauliflower Goujons, a vegan Asian Curry and a delicious Beetroot Carpaccio and a flavorsome Moussaka feature on the menu. There are also tempting vegan desserts such as Almond Rice Pudding included on the new menu. 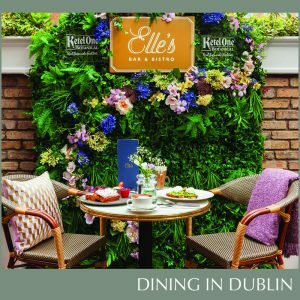 Elle’s Bar & Bistro in the Iveagh Garden Hotel has launched its new summer menu just in time for the warmer weather. Head chef Darren O’Brien has revamped the menu at Elle’s Bar to suit the season with favourites such as a Superfood Salad and Chicken Sriracha featuring on the bill of fare. Speaking about the dishes Darren says: “The inspiration behind these choices were what’s in season, what is local and what is popular, so I gave some old favourites a twist such as the Warm Rich Pudding which is flavoured with berry compote, vanilla ice cream, almond milk and toasted granola”. With summer holidays looming and bikini season around the corner, Elle’s Bar has created a “Conscious Beverage” list devised for those watching their waistline. The head mixologist Tomas Kreml at Elle’s has concocted a list of low-cal imbibements for those getting bikini ready before another heatwave hits. The new “Conscious Beverage Menu” at Elle’s consists of a tempting selection of delicious drinks without the guilt. All of the drinks on the list are only 130 calories or less allowing you to toast to a slimmer body. From the bar’s classic Bloody Mary to a host of gin and vodka-based creations using seasonal botanicals, there is something to cater for every pallet. The list of delicious drinks includes a new offering from Kettle One Botanical. Distilled with botanicals and infused with natural fruit essences for a crisp, refreshing taste, the new spirit drink from the well-known family-made vodka brand, Ketel One, is made with vodka but has a lower ABV of 30%, no artificial flavours and contains only 82 calories per serve. The new range is available in three delicious flavours- Peach & Orange Blossom, Cucumber & Mint, and Grapefruit & Rose. Served with soda water for a ‘Botanical Spritz’ and released during a wave of demand for ‘low and no’ alcohol cocktails and spritz-style drinks, Ketel One Botanical is the perfect choice for mindful drinkers looking for a new, thoughtful choice for their summer serve. Elle’s Bar at the Iveagh Garden Hotel launches “Bottomless Brunch” every Saturday from 11am until 4pm. Priced from €11.50 per person, the brunch menu at Elle’s has all of your favourite brunch-style dishes such as Eggs and Avocado and Brioche French Toast to go with their house cocktails list. Elle’s “Bottomless Pancakes” isn’t just your standard fare- the delicious American style pancakes are combined with a selection of fresh fruit and berry compotes to jazz things up a little! Elle’s recently transformed their heated outdoor terrace into a “Botanical Garden”, with features such as an outdoor bar area, hanging ivy and relaxed seating. It’s the perfect backdrop to a very Instagrammable brunch! To reserve a table email: ellesbookings@igh.ie or call 01 568 5500. The Iveagh Garden Hotel is Europe’s first sustainable hotel, meaning it generates its own electricity, heating and cooling needs through sustainable energy sources. Other energy-saving measures taken by the eco-conscious hotel include a gravity-fed wastewater system, motion-activated lighting, smart LED lightbulbs and low-energy lifts. The result is a reported 79 percent decrease in energy usage and an 82 percent reduction in CO2 emissions. Located on Dublin’s Harcourt Street, the hotel is an ideal base in the heart of the city for meetings, events, dining and luxurious city breaks. Housed in a beautiful four-story Georgian terrace building, the hotel is conveniently located 5 minutes from Grafton street and St Stephen’s Green as well as being accessible to all major transport links.